Gondola Shelving Uprights available in the Basic Upright, Wall Mountable Upright, and the Upright Extension designed to add to the height of an existing Madix Shelving system. Click the link above for a detailed installation movie that shows you how to install your new display shelving. Display shelving is a great way to display all types of items such as boxed items like soaps, paper items like toilet paper and paper towels, jarred items like jelly, peanut butter, canned goods like bulk soda, bagged items like chips, and small items that can be hung on a peg hook. Gondola Countertops are assembled using an existing Gondola Island shelf section with a countertop and Gondola counter brackets. Wood construction with top surface and edgework finished in choice of laminates. Available in widths from 8" to 48" and lengths. 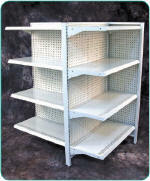 Madix Steel Storage Shelving for most storage needs such as retail back room storage and file storage.